Footprints in the Butter: Living out of my Pantry: How do I do this for the long-term? Living out of my Pantry: How do I do this for the long-term? Living from my pantry? What about when I do need to make this a long-term lifestyle? The TOS Homeschool Crew is doing a 5 Days of... Blog Hop, and I decided I would use this to push me into posting about some things I've meant to for awhile. 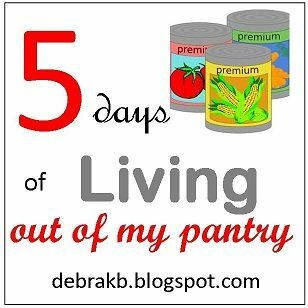 I will -- one way or another -- be posting every day this week on the topic of 5 Days of Living out of my Pantry. Yesterday, I posted about why this is an issue I care about and how we've relied on our pantry for months at a time. So what makes that possible? I said before that there isn't some shopping list that will make this work for anyone. You have to put some thought into this. What matters for your family? There are some general guidelines though. For me, stocking up my pantry is something that needs to mostly include fairly inexpensive food. Stocking your pantry also needs to include things that your family will eat. And that someone can prepare. You can have 100 pounds of dried beans stored under your bed... but if your family won't eat beans, or if you have no idea how to turn them into chili or bean soup or something, those hundred pounds of beans may as well be a hundred pounds of rocks. So what do I typically have in my pantry? And why? Dried beans. A variety of kinds. And yes, I know how to cook 'em. I usually cook them and freeze them in 2- and 3-cup containers. At my altitude, beans don't always get soft enough, and freezing them for later use helps them to be perfect. I use beans to make chili, soup of all kinds, to stretch hamburger in Mexican food, etc. Rice. Lots and lots of rice. I use rice as a base -- serving other food over it. I use rice to stretch soup, to stretch Mexican dishes, in eggs, etc. I'm starting to cook a big batch of rice up, and then using the "planned-overs" a cup or two at a time throughout the next few days. Flour. I get huge bags, store them in the freezer. I would LOVE to be getting wheat and grinding my own, but that is still in the saving-up-for stage. (Anyone want me to review a grain mill? I'm all ears...) With flour, I can make bread, biscuits, pizza dough, cookies, etc. I usually have at least 50# around. Yeast. I buy it at Sam's Club, and store it in the freezer. A few dollars gets me enough to last months, even when I'm baking bread nearly every day. Potatoes. I usually have a lot of fresh ones around (if stored right, they last a very long time) but I also will cube and fry them, then freeze them. Potatoes go into soup, my skillet breakfasts, and about a million other dishes. Serving a meal over mashed potatoes is a very inexpensive way to stretch the meal. A side of roasted potatoes works quite often too. Pasta. A variety of shapes and sizes. Tomatoes. Not the fresh ones, necessarily. But I do make sure I have canned tomatoes around. Lots and lots and lots. I make my own, or buy canned. But I always have a variety of tomato sauce, diced tomatoes, whole tomatoes, spaghetti sauce, salsa, pizza sauce, etc. I usually have some frozen tomatoes too. Powdered milk. I don't like to drink the stuff, but I use it almost exclusively in cooking. Oatmeal. The canisters, not little instant packets. Pancake mix. Okay, I know I could make my own with ingredients already in my house. But I determined that it is worth it to have the mix. That way, I actually make pancakes instead of thinking "I ought to." And it is so nice when we are in a living from the pantry phase to be able to EASILY do very inexpensive breakfasts... with a bit of variety. Spices. Good ones. Having a good Greek Seasoning Blend, and a good Creole one, and others makes the plain old rice a lot more interesting. I spend more than I could get away with on spices. But this is important to me. I have a steak seasoning that I love to put into stew. The Creole one makes eggs and rice taste a bit different. Various blends give a slightly new twist to the same potato soup. Other staples, like oils, sugar, salt, cornmeal, vinegars, etc. Those are my basics. I'm probably missing some. In addition, I try to have a variety of canned and frozen meats. I try to have some canned soup. That often makes a great base for adding a bit of this and a lot of that. I like having dried, canned and frozen fruit. Some goes great in oatmeal, or in pancakes, or as a dessert topping. I typically have frozen and (some) canned vegetables. And I try to pick up some of the extra stuff I'd use typically in my meals. The big thing here though is that you have to be using what you store. If your family balks at rice based casseroles, you can't be planning to serve them three nights a week if something happens that keeps you from grocery shopping. You need to be using what you store now too. Otherwise, if something happens, your family will feel deprived. And there's certainly the chance that half your stored food is going to be long past its "use by" date. Keep Hopping thru the Homeschool Crew Blog Hop! Just click on the graphic below. Great advice! Thanks for sharing - I have learned quite a bit from your series! Great series! I try to keep a well stocked pantry, too. I love not having to shop if I'm busy or am low on money, because we always have a good selection of food on hand. I save a lot by stocking up when things are on sale, too. Bible Bee! We're participating this year! Living out of my Pantry: Why is this important? Living out of my Pantry: Where do I start? Living out of my Pantry: What does that mean?